Managing IT | Taylor Data Systems, Inc.
Is your IT department overwhelmed by equipment maintenance, upgrades and service tickets? Are they struggling to manage immediate priorities of the business due to time spent supporting network, hardware and software issues? When you add it all up, between IT overhead and additional service costs, you’re probably spending a lot more time and money than you think. Many organizations are realizing they can’t do it all, and if they are, they probably aren’t doing it as cost-effectively as they could be. But how do you know when the time is right to make adjustments to the process? Are you spending more on maintenance contracts through multiple manufacturers than you would a single 3rd party? Is asset tracking handled manually? Do you struggle to report on the location, age and cost to maintain each asset? Have you built up a stockpile of parts to have on hand, only to realize at the end of the year that you’re still hanging on to thousands of dollars of unused parts? Is it important to you to be able to extend the life of your current technology, even if it’s on the end-of-life list with the manufacturer? Do your current maintenance contract terms lack the flexibility of a month-to-month option or customizing to fit your unique requirements? If you answered yes to any of these questions, it may be time to evaluate the total cost to currently maintain your assets, and research other more modern, cost-effective service solutions. There are a variety of solutions available on the market today that can offer you up-to-the-minute visibility on your inventory of assets, provide you with detailed data to understand the cost to maintain those assets, and more easily manage the maintenance, ownership and repair process for most every piece of equipment you have in your organization. Simplifying the process and minimizing steps for your internal IT team means more focus can be placed on other business priorities, without the worries of handling service calls, not having immediate access to asset history, or requesting spares and supplies. At TDS, we have developed relationships with leading service providers in order to provide you with the best service and support for a multitude of data collection, mobile computing and other electronic equipment brands used inside and outside the four walls. 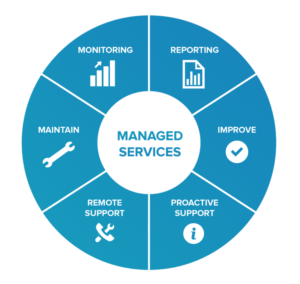 Download our Managed Services Datasheet, then contact us for more information.